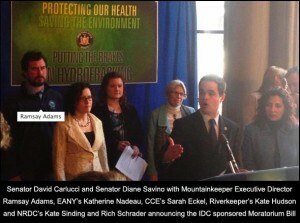 Yesterday, I joined Senators Diane Savino and David Carlucci at a press conference with other environmental leaders at the Capitol Building in Albany to announce that the Senate’s five-member Independent Democratic Conference (IDC) had unveiled legislation that would stop the clock on the State’s long consideration of the controversial natural gas drilling technique known as fracking. A similar bill that calls for a two-year moratorium based on a comprehensive health impact assessment is expected to be approved by the Assembly as early as today. The Independent Democratic Conference, which shares control of the Senate with Republicans, said this independent health review, known as the Geisinger study, and two other reviews on drinking water must be completed before Gov. Andrew Cuomo settles the five-year-old debate. “We have to put science first. We have to put the health of New Yorkers first,” said IDC member Sen. David Carlucci. “We cannot afford to make a mistake,” said Sen. Diane Savino of Staten Island, another IDC member. As reported in the Albany Times Union, DOH Commissioner Dr. Nirav Shah said last month that his agency’s review — conducted with the assistance of outside specialists — will be delayed as he seeks briefings from researchers currently examining fracking’s possible health effects in Pennsylvania. The IDC’s legislation makes specific mention of the need to wait for the completion of the three studies referenced by Shah in his February letter to DEC Commissioner Joe Martens informing him of the delay. The three studies include a federal Environmental Protection Agency investigation of the potential effects on drinking water, a study by Geisinger Health Systems examining the medical histories of those living near gas facilities in Pennsylvania’s portion of the Marcellus Shale region, and a recently announced study from University of Pennsylvania researchers in collaboration with Columbia University, Johns Hopkins University and the University of North Carolina. The bill would block the DEC from finalizing the environmental impact statement for two years from the bill’s effective date “or until the Commissioner of Health determines that the completion of the studies deemed relevant … have produced data sufficient to make a recommendation to DEC” on the health safety of fracking. Elected leaders from both sides of the aisle are putting strong pressure on Governor Cuomo to wait for the scientific studies that are already underway. We hope that the Governor will heed the recommendations of our State’s representatives and allow his Health and Environment Commissioners the necessary time to make informed decisions based on proper review of the completed studies. “Like most successful actors, Mark Ruffalo could plant his family anywhere, but he fell in love with Sullivan County’s trout-rich streams and hemlock forests; they reminded him of Wisconsin, where he grew up. At first Ruffalo was enthusiastic about the gas extraction rumors he heard in Callicoon. But that changed in June 2010 when he visited Dimock, Pa., just across the state border. He made that trip with environmental lawyer Robert Kennedy Jr. at the invitation of Ramsay Adams, founder and executive director of Catskill Mountainkeeper, a regional conservation group.